Moody Garden’s has a ton of fun. We highly, highly recommend this as a top Galveston fun place. There is a swanky hotel right on the property and there are several hotels within walking distance. The park is open 7 days 10am to 8pm. The water park here features a gigantic circular wave pool that everybody loves. Many people that live on the island go there just to use the float road. There are three glass pyramids that have various activities including IMAX. 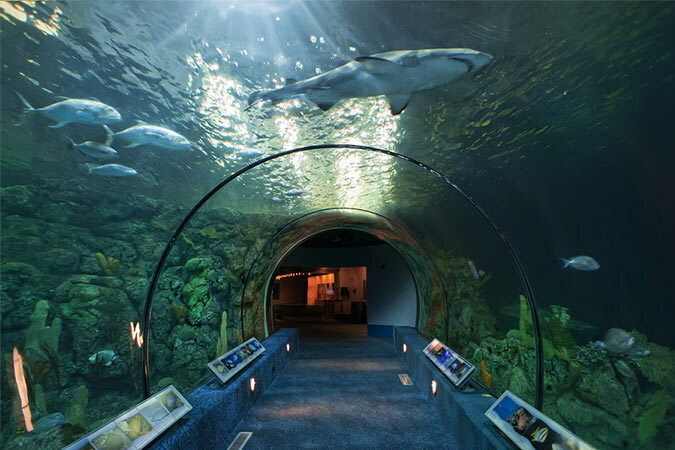 The aquarium has transparent tubes where you can walk right through the aquarium. How cool is that! And, yes, they have sharks. The butterfly house is in one of the pyramids and it’s a stunning exhibit. So many colors and sizes. Penguins too. We highly recommend that rainforest pyramid. Tons or critters including parrots, river otters, monkeys. This is not a typical zoo but a fully functional exhibit-home. The 3-D theater is great for kids of all ages. You can see the current films here. The Colonel Paddle wheel boat serves dinner on the sunset cruise. The boat leaves from the park and cruises around a little bay off of Galveston Bay. SPONGEBOB SUBPANTS ADVENTURE is here for the little ones. Dive Into Adventure! On this submarine cruise, you decide the destination and then try to get the silly captain to follow the course. This is a 3D attraction with varous effects and a whole boat load of special effects. It’s full of suprises. Jam, the science of music offers a great educational experience. Rope Course and Zip Line is an adrenaline rush of the highest order. Dinos Alive is just what it sounds like; 15 animatronic dinosaurs with all sorts of cool audio as well. Overall, Moody Garden’s is one of our top attractions and it never disappoints. The park is modern, safe and very clean.